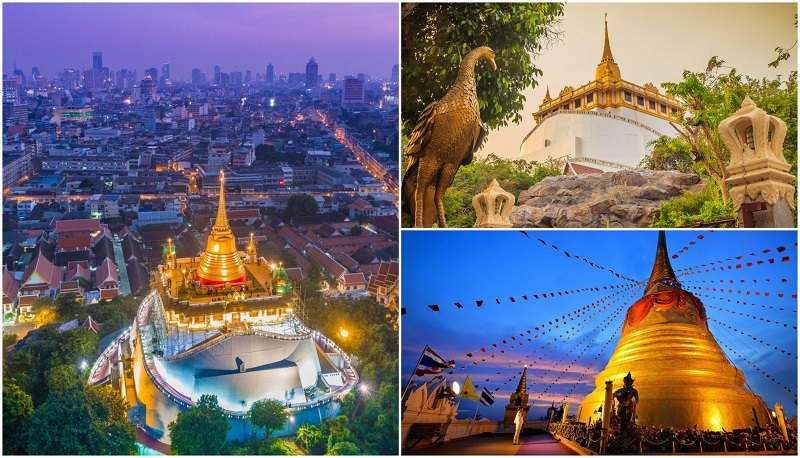 Are you planning a trip to Bangkok and looking for the perfect itinerary? If you’re a bit confused on things to do, what to see and where to go in Thailand’s capital, you’re not alone. 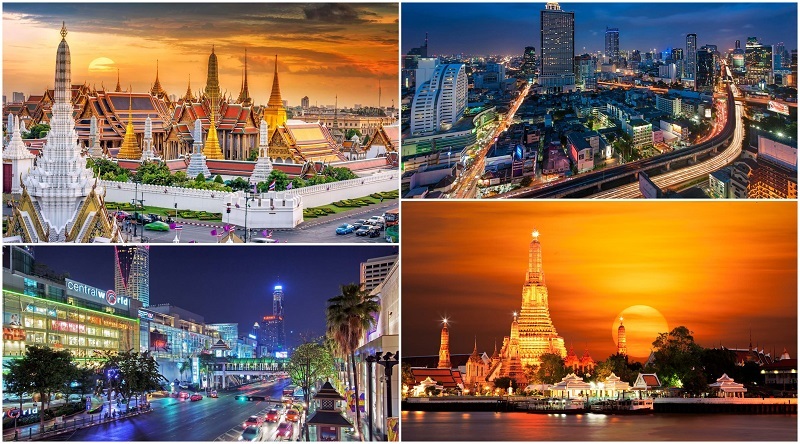 Bangkok is a buzzing city life, unlike some of Thailand’s other cities. 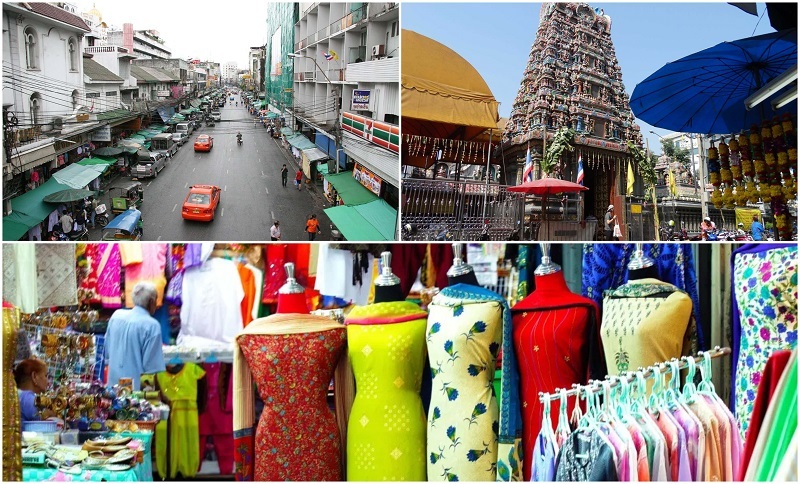 It has beauty, modern architecture, exotic weather, great shopping, authentic local food, charming neighbourhoods, and of course historic temples. Have a look at our 5 day itinerary in Bangkok which will give you plenty of things to do in this busy city. Day 0 – Flight to Bangkok, check in to hotel. Day 1 – Grand Palace, Wat Pho, Wat Arun, Golden Mount, River Cruise and Khao San Road. 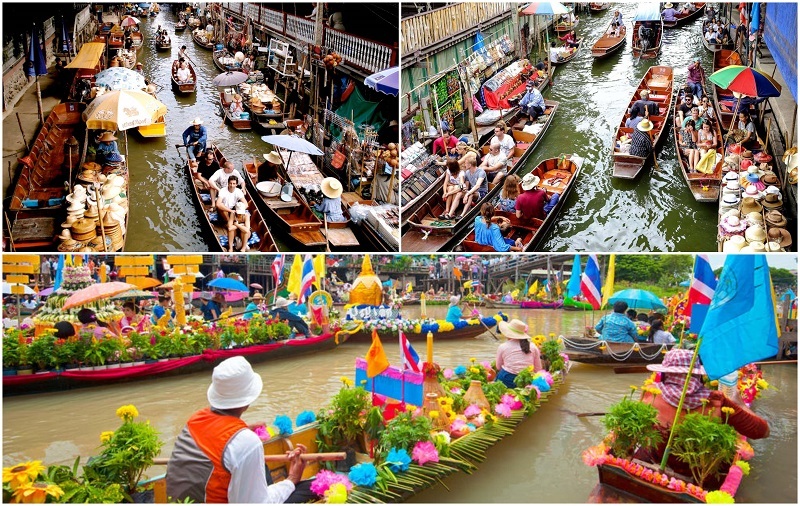 Day 2 – Damnoen Saduak Floating Market, Chinatown, Phahurat and Siam Niramit Show. Day 3 – Central World, Platinum Fashion Gallery, Siam Paragon, Siam Center, Madame Tussauds, Bangkok Arts & Culture Center, Dinosaur Park, Benjasiri Park, Soi Cowboy and Nana Plaza. Day 4 – Chatuchak Market, massage, Octave Rooftop Bar, and RCA. Day 5 – Jim Thompson House, Lumpini Park, and fight back home. Suvarnabhumi Airport is about 30 km away from downtown Bangkok. Your best bet after arriving is either taking a cab for around 400 THB or taking the airport rail link for around 50 baht. The airport itself is neatly organised and signs are everywhere to guide you to your preferred transport option. Where ever you’re coming from, it’s usually a tiring trip and it’s much easier to have transport pre-booked. Book a private English speaking driver who will meet you at the airport. They will be holding a sign up with your name and will assist with your luggage before driving you to your hotel. There are a lot of great hotels in Bangkok that are very reasonably priced when you consider the value you’re getting (usually 30-50 USD a night). I’ve been to the Grand Palace around 3 times in my life and it’s never failed to impress. The artwork and decoration on the temple is absolutely exquisite and it looks like a shining gem in the sunlight. The overall palace complex is actually quite large so you’ll be walking around extensively. Bring your best camera because this place is prime photo shoot area. Definitely make sure to visit the Emerald Buddha here as that’s the star attraction. I was travelling with my Thai girlfriend the first time I was there and she taught me how to properly pray. It was physically quite taxing but definitely a great cultural experience. Tip – When it comes to visiting temples or basically any official/formal environment: make sure you’re covered up. No knees, no thighs, no shoulders and no chest/cleavage. The security guards will literally not allow you to enter. If you’re walking around all day in your jeans is somehow too hot for you, there are stores around the Grand Palace that offer rental pants. It just takes some time to line up for them. 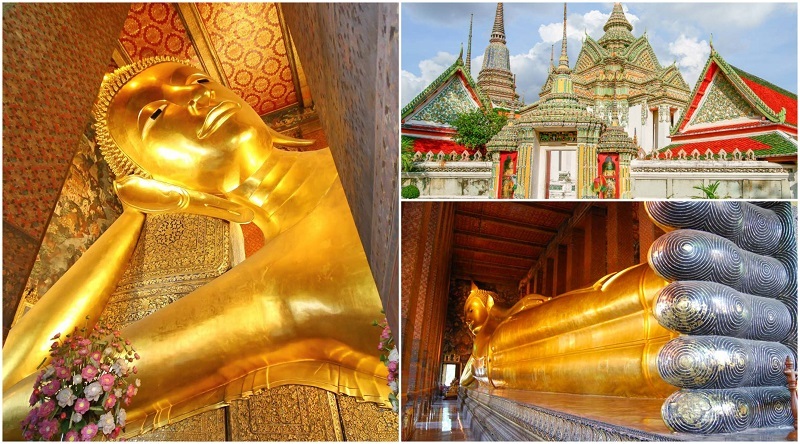 Wat Pho is a just a short walk away and is the younger brother to the Grand Palace. It’s smaller, less fancy but has a certain rustic charm about it. Also it’s the home to a giant reclining Buddha. You’ll need to take your shoes off when entering the temple but it’s a great feeling to feel the cool stone floor after the heat outside. Wat Pho is also known as the place where Thai massage was developed and they have the services available at certain times. People usually say that the real Thai massage is pretty painful but these Wat Pho monks will pretty much break you into little pieces and put you back together again. I have to say, it was pretty good. Wat Arun is right across the river from Wat Pho so you just go to the river front and take a ferry for 20 baht. Wat Arun is a unique temple in Thailand in that it actually boasts a Khmer style architecture rather than the typical Siamese style. Basically, it looks like a mini Angkor Wat. The walk up to the top can be a bit harrowing for some as the steps are narrow and very tall. But that’s part of what makes visiting this temple so fun. There are a lot of street food options right outside Wat Arun if you’re after a quick snack. You’ll need to take a taxi to get to this temple but it’s absolutely worth it, in my opinion. The steps that lead to the top are surrounded by beautiful trees delicately letting the sunlight in through its leaves. Once you get to the temple at the peak, you’ll be greeted with a beautiful view of old Bangkok with its old fashioned buildings and winding streets. Best of all, there aren’t a lot of tourists here making this my personal favorite temple in Bangkok. Tip – If it’s your first time taking a tuk tuk, by all means go right ahead. Just remember that tuk tuks are notorious for cheating customers with their exorbitant prices and for randomly taking you to jewellery stores hoping they’ll get some commission. They’re paid by those stores to bring you there and you’ll need to be firm with the driver on where you want to go. Also, haggling with a tuk tuk driver isn’t really worth it as you won’t save more than 5 USD anyway. 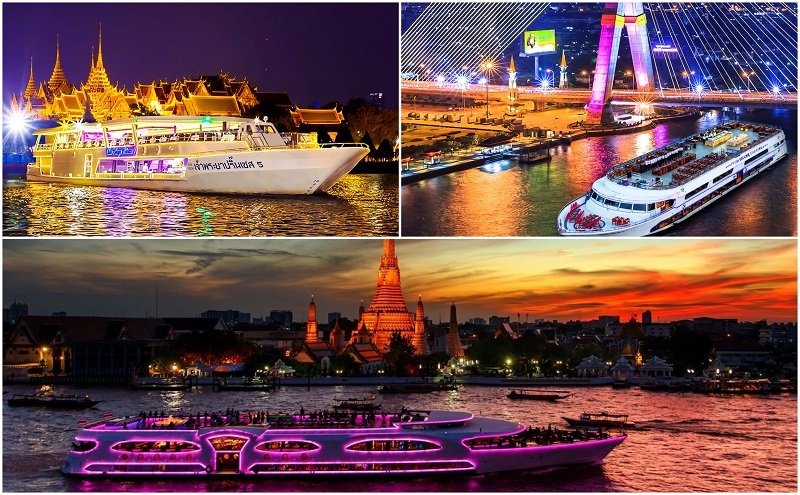 There are a number of river cruises available in Bangkok. 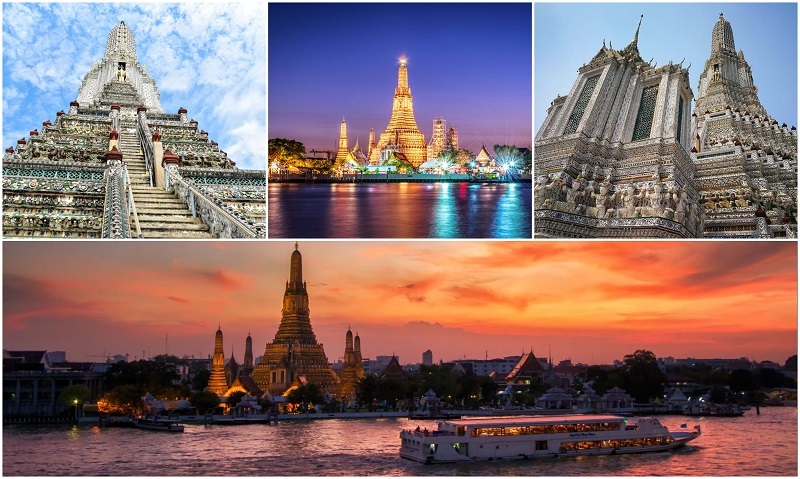 The cruise will take you down the Chao Phraya river, the lifeblood of Bangkok, showing you familiar sights such as the Grand Palace and Wat Arun in spectacular lighting. I went on the Princess cruise myself and there was international cuisine served and live music available. There are no rules in terms of dress code which is a nice change after seeing all the temples. I’m not sure if there’s a backpacker in the world who hasn’t visited this famous street. It’s pretty much backpacker heaven. Dirt cheap hostels, a cornucopia of services for visas, documents, tours, bars, pubs, clubs, restaurants, massage parlors, and shops that sell Bob Marley t-shirts. You name it, they probably have it. Either way, it’s a pretty good place to go for a drink. Personally I always enjoyed going to a bar right in the middle of it called D&D. 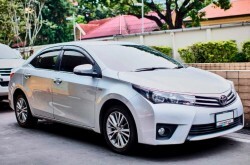 Tip – A quick tip on Bangkok taxis: anyone that quotes a price is cheating you. It’s illegal and they know it. However, in places like Khao San, that’s the only kind of taxi you’ll find. You could always walk down the road and get a normal, respectable cab but that’s up to you. Damnoen Saduak floating market is about a hundred kilometers away from Bangkok. It is a great spot for lazily drinking sugar cane juice, eating local cuisines, getting a massage and just watching people sell their wares in their boats. Instead of going to Damnoen Saduak, you can also go to Ampawa. Both of them have river tours but Ampawa has a tour where you can see fireflies. I went to Damnoen Saduak on my tour but I also checked out Ampawa when I came later. They were both very good. There are other floating markets within the vicinity of Bangkok like Talin Chan but they’re much smaller. I love this area of Bangkok for its rustic feel. Everything is very lively and things are on the cheap. You can enjoy the beautiful Wat Hua Lamphong and if you’re interested, you can also check out Hua Lamphong train station, the oldest of its kind in Thailand. Maybe you’ll be taking a ride from here on your trip? Chinatown has so much good Chinese food available. Called Yaowarat by the locals, it offers fried chestnuts, oily ducks, shark fins and much more. Sometimes called Little India, Phahurat is pretty much the only place in Bangkok where you can get good cheap Indian food. Personally, I’m a big fan of the 10 baht samosas. If you have time to spare, you can take a cab to Sri Mariamman temple, one of the few Hindu temples in Bangkok. It’s definitely a sight to behold with its intricate figures adorning the whole temple. 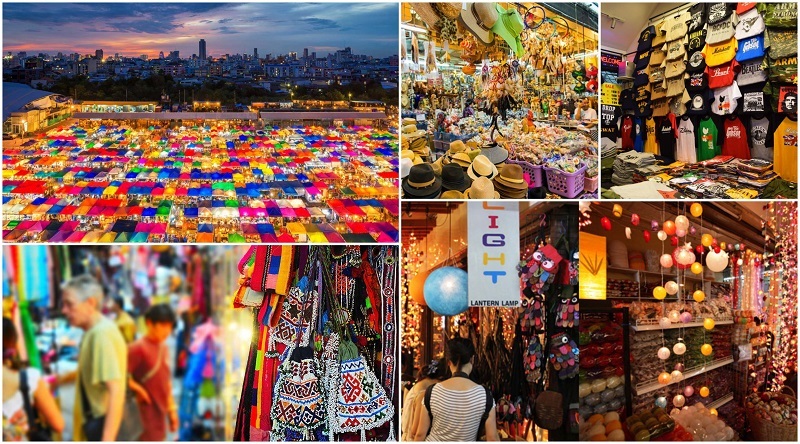 Stroll around the Phahurat markets and see if you can grab some bargain souvenirs. You can take a cab directly to Siam Niramit theater or wait at your own place for them to pick you up. Before the grand show, you can enjoy a delicious dinner buffet at the same venue consisting of local and international favorites. This is a concert with traditional music and dance with fabulous costume design and artists who are passionate about their craft. With it’s huge cast of actors and animals, you’ll learn about the history of Thailand, festivals and customs in a stadium-like theatre. After the show, your chauffeur will drive you back to your hotel. Central World is probably the biggest mall and definitely my favourite place to watch movies because of its modern and clean facilities. Watching movies in Thailand is also a cultural experience. Before the movie starts, you will need to stand up and watch a one minute clip of the King. I’m not kidding! Make sure you stand up to show respect. Platinum is a mall where you go to if you want to buy cheap and in bulk. Roving bands of young girls looking for the next best deal are a common sight. Right outside these two malls is Baiyoke 2, one of the tallest buildings in Thailand, and Erawan shrine, a beautiful shrine in the middle of downtown. 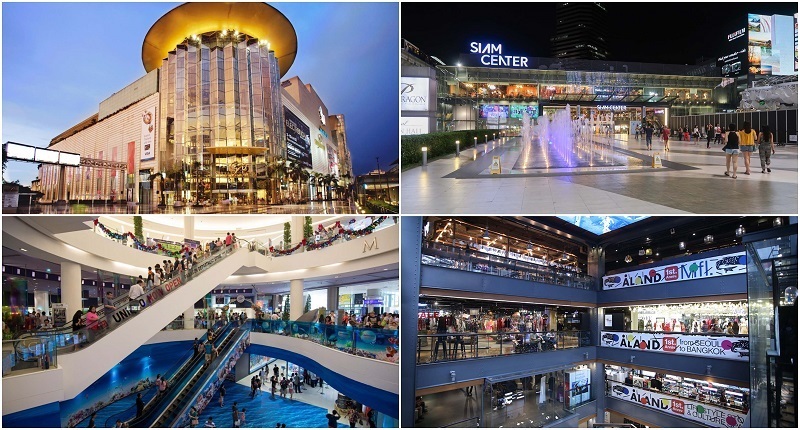 Siam Paragon is the high end mall with all the various luxury goods available. Also the walkway between Siam Paragon and Siam Center is a great place to relax and take photos with its fountain and, occasionally active, stage. Right opposite these malls though is a small area called Siam Square and in there, you can find some of the best papaya salads in a restaurant called Som Tam Nua. Also there’s a wonderful mango ice cream bar in the middle of Siam Square. Right next to it is the Scala theater, a classic Hollywood style cinema offering very cheap tickets. If you’re still looking for that fantastic pad thai, I’d recommend you to visit Black Canyon Coffee in any of the major malls you drop by. Madame Tussauds is a great place to break up all the shopping. 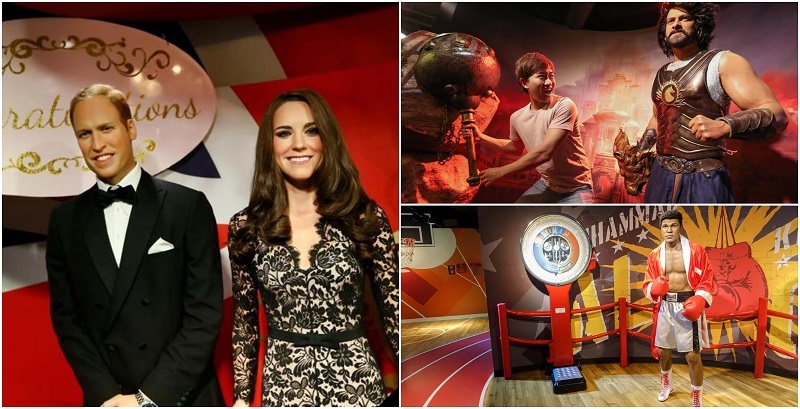 Take photos with wax figures of your favourite international and local celebrities. It’s a small place but there are enough life like celebrities to enjoy an easy 1-2 hours of fun. BACC especially is perfect for checking out the latest in what Thai artists have to offer. Right opposite is the notorious mall, MBK, where they sell all kinds of clothes and electronics for dirt cheap prices. I basically go to everything dinosaur related whenever I travel but I have to admit the Dinosaur Park was a bit disappointing. Small, a bit on the barren side when it comes to fossils and the exhibits weren’t very fun. 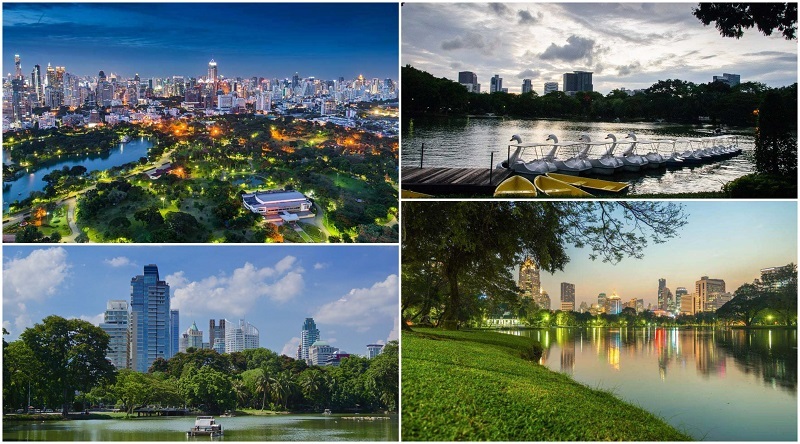 Situated cloeby, it has beautiful forests and is surrounded by a wonderful Bangkok skyline. A lot of the families in this fancy part of town come here to unwind and it’s definitely a great place to catch a sunset. Also they play the national anthem at 6 pm so make sure to stand up while they do it! Just 10 minutes away from Benjasiri Park is Asok, a busy business district known for its great variety in food and shopping. 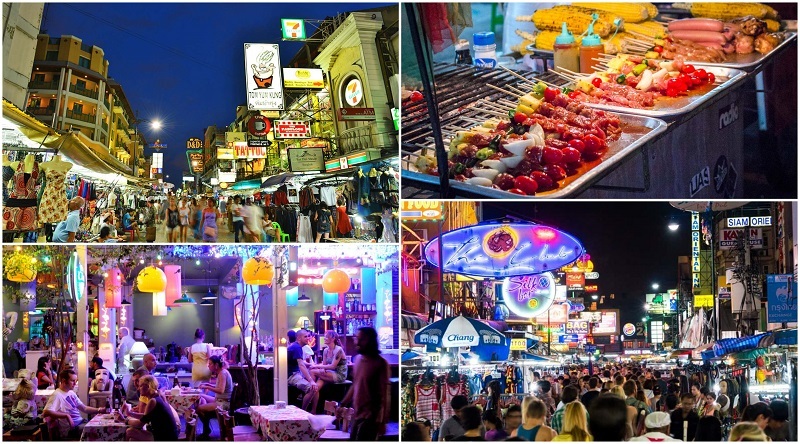 At night though, Asok comes to life, as visitors head to bars and clubs at Soi Cowboy for adult entertainment. 15 minutes from there is Nana Plaza, a 3 story complex fully reserved with more adult entertainment. We had someone go there to share insights on Nana Plaza. Of all the markets, I went to in Thailand, Chatuchak (or JJ market) is definitely my favorite. It’s so big that they literally had to build a mall just to serve as its outlet and it’s very easy to get lost in its labyrinthine streets. However, you can spend literally hours here enjoying food, sights, clothes, art, and antiques. They also have open air bars with live music in case you want to relax. Tip -There’s a reason this place is called a weekend market. Plan accordingly. By this time of the trip, I’d already experienced a number of massages but I wanted to treat myself to something special after all the walking at JJ market. 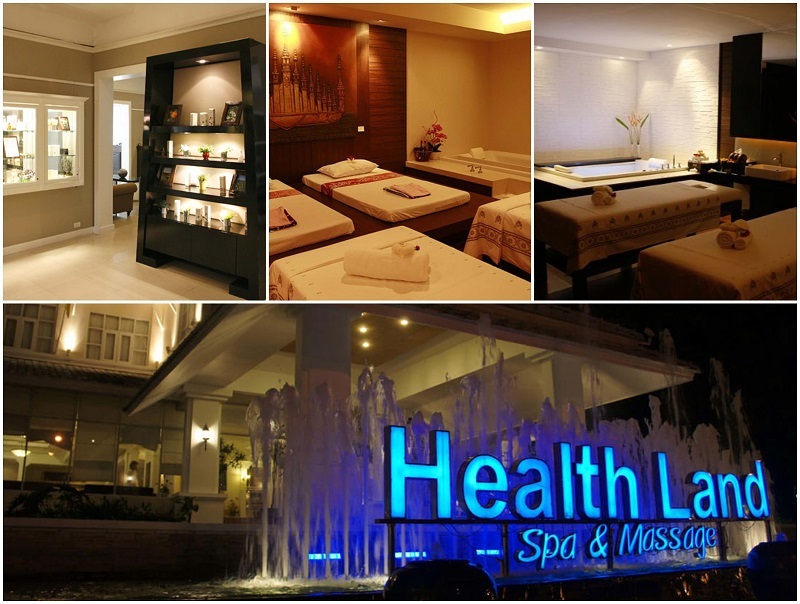 So I went to Health Land, a massage parlor chain, that has both great value and consistently great service. It’s 550 baht for a 2 hour Thai massage (100 baht as a tip to the masseuse) and I just basically napped through the entire thing. There are cheaper and more local places, but you just can’t beat this place for sheer value. I’ve been to a number of rooftop bars in Bangkok over the years but Octave stands above the rest for me. It has a full 360 panoramic view and offers great music and service. Catching a sunset here is a must. Here, we come to the last of our great party areas: RCA. It’s about a 15 minute cab ride from Octave depending on the traffic and it’s a street with a lot of clubs lined on either side. The most famous of them probably being Route 66 and Onyx. 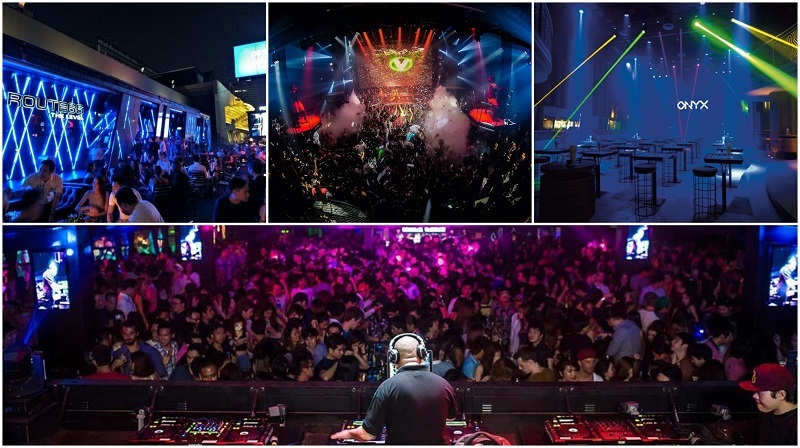 If you’re looking for one last fun night in Bangkok, this is a great spot to be. Jim Thompson was an American businessman that had a pretty big role in revitalising Thailand’s silk industry back in the 50s. He also went mysteriously missing and has been the fascination of many a conspiracy theorist. But his house in downtown Bangkok is definitely worth a visit as a serene sanctuary away from the hustle and bustle of Bangkok. 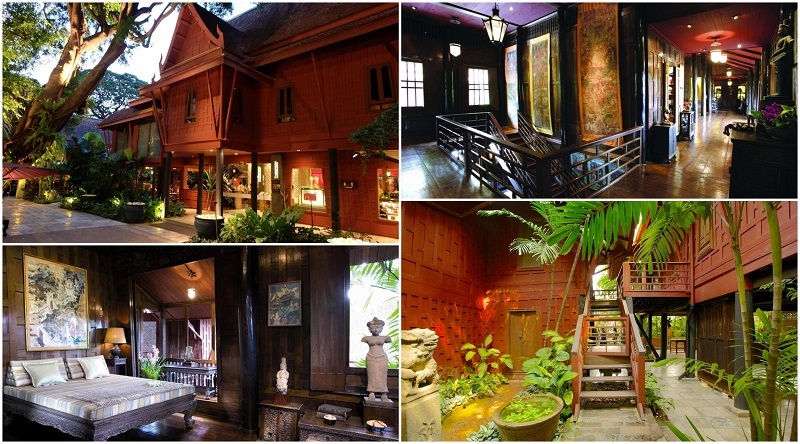 It’s a series of traditional Thai houses made of teak and just exude that old world exotic charm. if you are interested in buying silk, this is the perfect place for it. 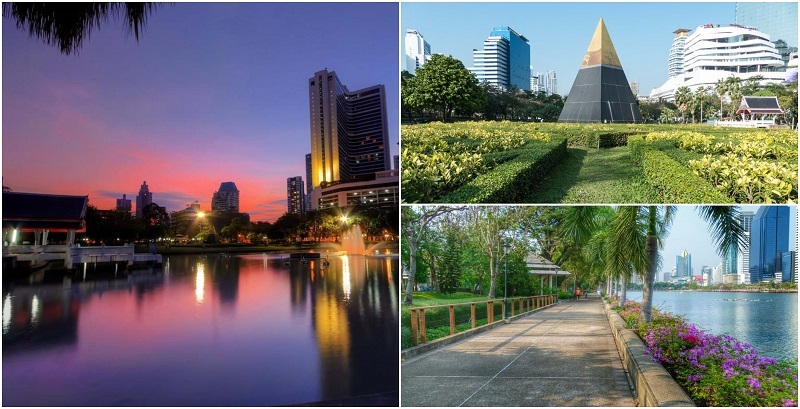 This one is probably the largest parks in Bangkok and is a wonderful place for a stroll with family and loved ones. Located very close to Silom and Hua Lamphong, you can easily spend an hour or two simply enjoying the nature of Thailand without the actual hassle of going to the nature of Thailand. The sunsets at the lake front are also definitely not something to scoff at. Pretty much everyone in the tourist areas can speak some level of English but if you’re hailing a cab from anywhere else, you’re going to need a smattering of Thai (or a very sympathetic taxi driver) to get to places. The good news is that just showing the Thai name of the place you’re going to via your phone to the taxi driver works pretty well. You can get a BTS sky train for card 200 baht and that’ll save you from any time queuing to get tokens. Rush hour can cramp hundreds of people into the platforms and that can be very unpleasant. Get a tourist SIM card with 3 GB of data at least to help you with navigation on Google Maps and other research while you’re in Bangkok. Bangkok is definitely a place to contemplate the beauty of food. If only my belly could cooperate to the full extent of my desires. I spent a lot of late nights in Bangkok and I was relieved to find out that it was all very safe. 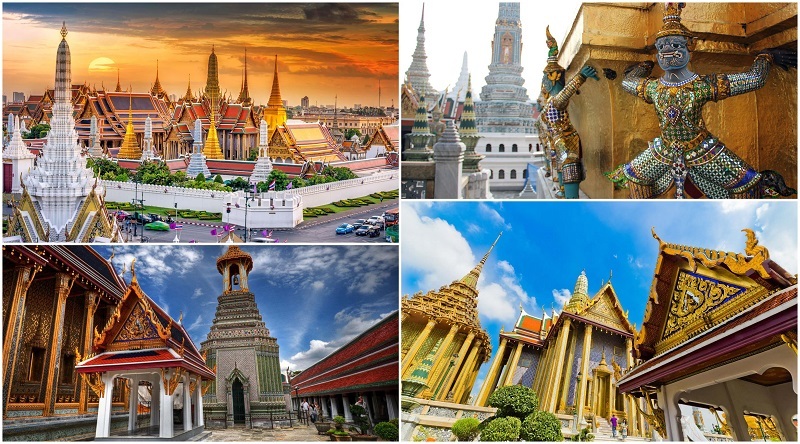 During the day, you’ll have no problem finding things to do in Bangkok with major attractions in all parts of the city. This itinerary will definitely make the most out of your trip. As far as the Grand Royal Palace goes, DEFINITELY go see it, but I would reccommend going even earlier than 10am. If you’re a morning person or can swing an early wake-up call, go to the GRP at around 8am. This way you’ll beat the heat and the crowds and you’ll have a more enjoyable experience overall. Overall, there are some great recommendations on here! Definitely true about covering up for many places – I suggest buying a cheap shawl and pair of pants/sarong that you can easily fit into a bag and take out as needed. You really hit the major destinations and things to do in Bangkok, but keep in mind that jetlag and travel sickness can really get you, so make sure to get enough rest and take care of yourself – even if it means skipping a spot. The only thing I’d like to see more of on here is suggestions for those of us traveling on a budget. While $30-$50 per night on a hotel is comparatively cheap, you can also stay the night in hostels for a week or more for that much money. Wow! I would have a hard time fitting all this in, but I really enjoyed taking my time in the temples. The article talks about covering up, and it is very true! Wear very conservative clothing, long pants and shirt, and when in doubt, cover up. The temples will not let you in if you are not. Be respectful, too. It was hard going to some of these places and seeing tourists take the culture and religion lightly! That said, the floating markets and museums were so cool! The market was loud and hectic but very thrilling. If it were me, I would pick a sampling of these and do it on a looser schedule. The recommendations are all good, though.